Vanessa German, American, b. 1976. sometimes. we. cannot. be. with. our. bodies., 2017. Mixed-media installation. Image courtesy of The Fralin Museum of Art and the artist. Entitled sometimes. we. cannot. be. with. our. bodies., the installation was originally presented at the Mattress Factory in Pittsburgh, Pennsylvania, in 2017. It was organized for the Fralin by Matthew McLendon, the Museums J. Sanford Miller Family director. The installation in Virginia combines sculpture, soundtrack and text across two galleries, creating an impactful and responsive visitor experience. Vanessa German (born 1976) is a visual and performance artist based in the Pittsburgh neighborhood of Homewood. 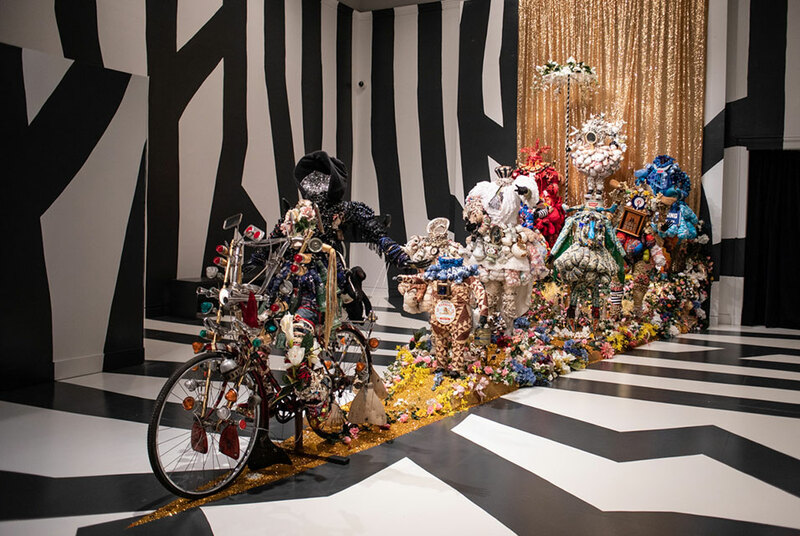 Her community in Homewood is the driving force behind Germans powerful performance and mixed-media work, and where she sources many of the cast-off relics that form the language of her copiously embellished sculptures. As a citizen artist, German explores the power of art and love as a transformative force in the dynamic cultural ecosystem of communities and neighborhoods. She is the founder of Love Front Porch and the ARThouse, a community arts initiative for the children of Homewood. Germans work has been collected and exhibited throughout the U.S. The artist is featured in the documentary State of the Art, which will premiere on PBS in April 2019. In December, German received the 2018 Don Tyson Prize, a major biennial award from Crystal Bridges Museum of American Art that recognizes significant achievements by an American artist. The artist will be in residence at the University of Virginia during March 2019, connecting with UVA students and community members of all ages through artmaking, creative writing workshops and special tours designed to deepen engagement with the artists work and concerns.